Texas' biggest county bolsters flood rules. Will Houston? HOUSTON — Leaders of the most populous county in Texas voted for stronger floodplain regulations yesterday, more than three months after Hurricane Harvey slammed the state. But Harris County's move is aimed at new construction in unincorporated areas. Houston, which accounts for about half of the county population, will need to toughen its own requirements if it wants change. "We looked up and said, 'We gotta deal with this. This is job one,'" County Judge Ed Emmett said in an interview yesterday. Harvey struck in late August, causing destruction along the Gulf Coast and directly or indirectly killing more than 90 people in Texas. In Greater Houston, the storm damaged well over 100,000 homes and caused the third major flood in three years. Recent research suggests climate change will make storms more frequent and intense in Texas in the coming decades (Energywire, Nov. 17). Emmett cautioned in a recent speech that many people outside the region see Houston and Harris County as a "flood-prone swamp," and he urged action to change that perception. How governments at all levels respond to flooding threats will help guide the future of development in and around Houston, the historical home of the oil and gas industry. The city of Houston is acting — depending on one's viewpoint — either slowly or prudently as it considers its next steps in flood management. Yesterday, county officials questioned a delay in getting data from the city. Emmett said getting a count of which homes flooded in the city and how much water they had can affect flood-control planning and money allocation. Emmett said he thinks the city will take some action, adding that Houston Mayor Sylvester Turner doesn't want to see more flooding. Unincorporated areas have substantial parts without buildings, the judge said, while Houston is more built out in places. Regardless, the county was able to pass changes with a general lack of pushback from the development community. That may leave people wondering what Houston is doing as the county plows ahead. "That's a logical feeling to have," Stephen Costello, Houston's chief resilience officer, said in an interview this week. "I understand that, but I think we're just not ready to roll things out." Costello said the city would evaluate the county's plan and its own work and see what other issues need to be addressed. 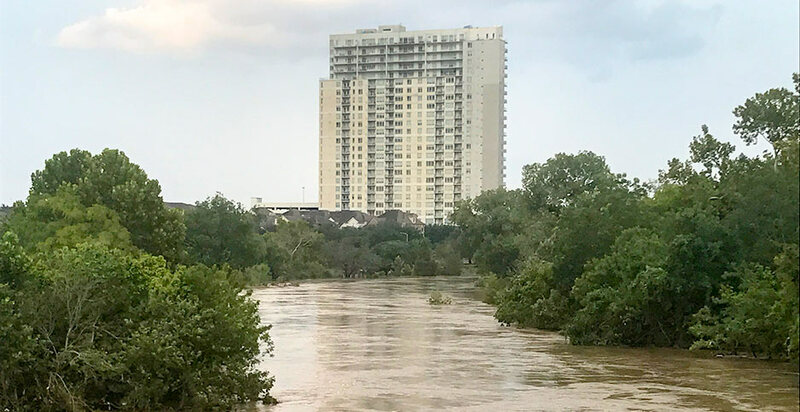 Yesterday's unanimous vote by the Harris County Commissioners Court means new developments will have to be higher in certain flood-prone areas. Letters of support for proposed changes in the county came from groups such as the Greater Houston Builders Association and the American Council of Engineering Companies of Houston. "The County is definitely headed in the right direction — the City of Houston, not so much," Ed Browne, an organizer of Residents Against Flooding, said in an email, adding, "The City is notorious for not enforcing its regulations and allowing all kinds of shenanigans." The new rules will apply to unincorporated areas, which Emmett estimated are already home to about 2 million people. Harris County already required a new home in the 100-year floodplain to have a finished floor 18 inches above the theoretical flood line. Houston requires only 12 inches. A recent county memo laid out aspects of the new regulations aimed at new construction. A building in the 100-year floodplain will need a floor 24 inches above the 500-year level. A building in the 500-year floodplain will need a floor at or above the 500-year level. Outside of a mapped hazard area, the memo said, a building will need a floor that's 12 inches above adjacent natural ground or the crown of the street. In Costello's view, Harris County and Houston likely will end up with similar regulations around development in the wake of flooding concerns. So is Houston looking at requiring people to build higher on new developments? "I would suggest that the city is not ready to make that position public, but I would think at the end of the day we might gravitate toward that," Costello said. Costello's work involves looking at long-term fixes. Options for Greater Houston range from changes around reservoirs and bayous to buying out homes to elevating existing homes. Costello is part of a recovery team and emphasized that change will take time. In the meantime, worries persist about future rain events and the potential for flooding. State and local leaders continue to seek more federal money that can be used in recovery and mitigation efforts. "Harvey recovery is going to probably be a 10-year process at the end of the day," Costello said. New regulations in Harris County are slated to take effect Jan. 1. Emmett, speaking to reporters yesterday, said the changes mean the county will have "the toughest, the stiffest flood building code regulations in the country." Regulations could be adjusted in the future, and older homes may still need protection or alterations. But Emmett said the goal is to be as safe as possible going forward. "We want to make sure that nobody is building in an area where it's going to flood," he said. "That's the bottom line." John Blount, county engineer in Harris County, said the new regulations would lead to fewer new homes in flood-prone areas. "The only place you're going see people build houses in the floodplain is where there's a real feature — on Lake Houston, some water body like that," he said. If Houston doesn't act, homes and other buildings could be built to competing standards on opposite sides of the same street. In some parts of the region, the new Harris County regulations would require new homes to be built several feet higher than existing city regulations. "That is not the ideal by any means," said Robert Moore, who studies flood issues for the Natural Resources Defense Council. "You're going to accomplish a lot less if they're both not on the same page." The rules also acknowledge that the floodplain maps, which are drawn by the Federal Emergency Management Agency with input from local governments, don't give a clear picture of the risk from floods. New regulations aren't the end of the county's push for change. Emmett said a third reservoir for the Houston area remains an important project to tackle. He said he'd like to see Texas step up and fund it. "The state of Texas is sitting on a $10 billion rainy day fund," Emmett said. "The cost of the third reservoir is estimated at $500 million. That's 5 percent of the rainy day fund." The judge also talked about designating a couple of lakes in the region as flood-control projects and not just water-supply projects. A change could mean water is released in advance of a major storm. Emmett said new rules in Harris County could add thousands of dollars to the price of a house. But he said people don't want to buy a home that's going to flood. "Whatever the cost is, that's just the cost of doing business if you're gonna live in that area," Emmett said. Costello is also looking to get past the idea of the region as a flood-prone swamp, even if Houston is taking a different approach from the county so far. "My recommendation to the recovery team is to sit back, let's not react, let's take a concerted effort, and let's look at the ramifications of everything before we make a change," Costello said.